In past decades, most people were unaware of the State’s contentious water issues. Today, due to the drought, Californians are very mindful of the need to conserve water and it is influencing the way many of us go about our daily lives. Drought is just one critical challenge to our water future. The other challenge—not yet fully recognized—is the gradual loss of the snow pack that accounts for about one third of California’s water supply. The snow pack acts as a natural reservoir equipped with an automatic release mechanism. The snow gradually melts every spring and summer, refreshing our water supplies when we need it most. But when temperatures are too high to build a snow pack, this precious precipitation rushes down rivers and streams, overflowing capacity and flooding populated urban areas. According to UC Davis Professor Helen Dahlke, in a wet year we can loose 15 million-acre feet to flood flows. This is water that we cannot afford to loose. While some look to dams and reservoirs as a solution, this strategy is proving to be far too costly. According to the Public Policy Institute, five recently proposed above ground storage projects—costing roughly $9 billion—would expand average water supplies by only 410,000 acre-feet. A far more simple and cost-effective alternative makes use of the natural reservoirs under our feet. California aquifers have about a billion acre-feet of reservoir capacity. In relative terms, the aquifer in the Sacramento region, for example, is capable of storing about three times more acre-feet of water than Folsom dam. Recharging the aquifer using natural or managed groundwater recharge is not a new idea in California, we just need to do a lot more of it. 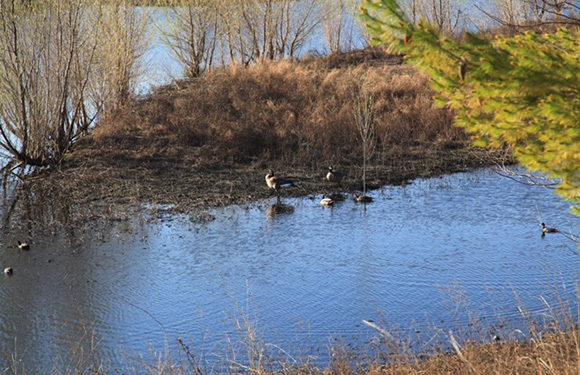 The Santa Clara Valley Water District currently controls nearly 400 acres of recharge ponds, 91 miles of controlled instream recharge, providing them with about 100,000 acre-feet per year. The City of Fresno’s water department is depositing over 50,000 acre-feet a year from 225 acres of recharge ponds. These projects are critically important but not nearly enough. In most places, more water is being withdrawn than is deposited. University of California researchers have identified and successfully tested another strategy. They have identified 3.6 million acres of privately owned farmland where the topsoil is porous and the hydrogeology accommodates delivery of water to the aquifer. According to Professor Dahlke, absorbing an extra few feet of water on just 10 percent of California’s suitable cropland could add 3 million acre-feet to our groundwater supplies. Stanford University Professor Rosemary Knight is using electromagnetic imaging to pinpoint “super recharge” sites, where water hits the ground and quickly finds its way to the aquifer below. This technology allows us to identify and preserve the most precious sites using the general plan and zoning laws. A few local governments, including Santa Cruz and Butte counties and the cities of Tulare and Fresno are already using the general plan to steer development away from important recharge lands. For the past three years, the University of California Agriculture and Natural Resources division and the California Economic Summit have invited the most innovative leaders in groundwater recharge to an annual symposium to share their cutting edge model projects and pinpoint what is needed to move them to scale. These experts all agree about the need to focus on projects that have more than one benefit. The successful undertakings are the result of partnerships between land use authorities, water supply districts and flood management entities. Others have involved university researchers, agricultural growers, nonprofit organizations and/or habitat or resource conservation interests. All have resulted in more cost-effective, win-win solutions. The Tulare Irrigation District, a relatively small water provider in the San Joaquin Valley, uses this approach with excellent results. The district partnered with the City of Tulare to jointly purchase land for the purpose of groundwater recharge. Both entities benefit by the increase in available groundwater. The irrigation district also manages the city’s urban runoff to recharge groundwater while saving infrastructure and maintenance costs for the city. The city’s general plan assures future groundwater supplies by protecting important groundwater recharge areas within its jurisdiction, including open spaces, natural habitat, floodplains and wetland areas. The Tulare Irrigation District also partners with growers located on privately owned land that is suitable for groundwater recharge. Using an important new tool created by Sustainable Conservation, they identified the most cost-effective opportunities, and work with qualifying growers who receive fiscal incentives for letting stormwater soak into the ground instead of planting crops. In 2017, one project of 600 acres delivered 6,800 acre-feet of water to the aquifer in just three months. There is no single recipe for success; just a multitude of options that must be pursued if we are to assure a sustainable water supply for California’s future. If Professor Dahlke is correct, we need to find ways to put 15 million acre-feet a year into the ground by the time the snowpack is diminished. If the public, private and nonprofit sectors work together, it can be done! Judy is the former executive director of the Local Government Commission and a leader in the CA Economic Summit’s Working Landscapes Action Team.